Joining the Laysan albatross as icons of ocean plastic pollution are sea turtles, which consume bellyfuls of debris while swimming through Earth’s five great ocean garbage patches. 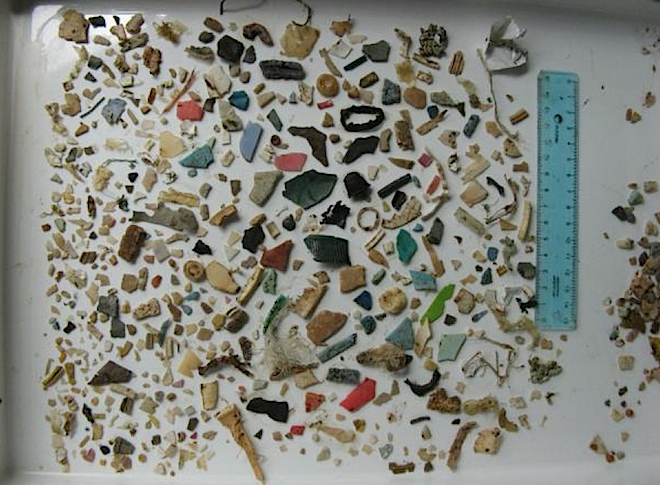 Pictured above are the stomach contents of a juvenile sea turtle accidentally captured off the coast of Argentina. The image echoes famous photographs taken by Chris Jordan and Susan Middleton of decomposing albatrosses on the island of Midway. About 0.25 percent of all plastic ends up in the ocean. That might not sound like much, but humanity produces about 260 million tons of plastic a year. Tiny fractions add up fast. Oceanic plastic is pulled into the center of rotating currents, or gyres, where it doesn’t degrade, but breaks into smaller and smaller pieces. Some pieces end up in plankton and algae, or drift to the ocean floor. Others are mistaken for food by turtles. The phenomenon is described in a new research review (.pdf) published by the Global Sea Turtle Network and spotlighted by the fifth International Marine Debris Conference, now ongoing in Honolulu, Hawaii. One anecdote in the article, written by biologists Wallace Nichols of the California Academy of Science and the University of British Columbia’s Colette Wabnitz, stands out. “Relief of gastrointestinal obstruction of a green turtle off Melbourne beach, Florida, resulted in the animal defecating 74 foreign objects over a period of a month, including four types of latex balloons, different types of hard plastic, a piece of carpet-like material, and two 2- to 4-mm tar balls, they wrote. Like so many environmental problems, ocean plastic seems overwhelming. But countries like China, South Africa and Thailand are already taxing or banning single-use plastic bags, which pose the greatest threat to turtles. Images: 1) Debris found in the gastrointestinal content of a juvenile green turtle accidentally captured in Bahía Samborombón, Argentina./Victoria González Carman. 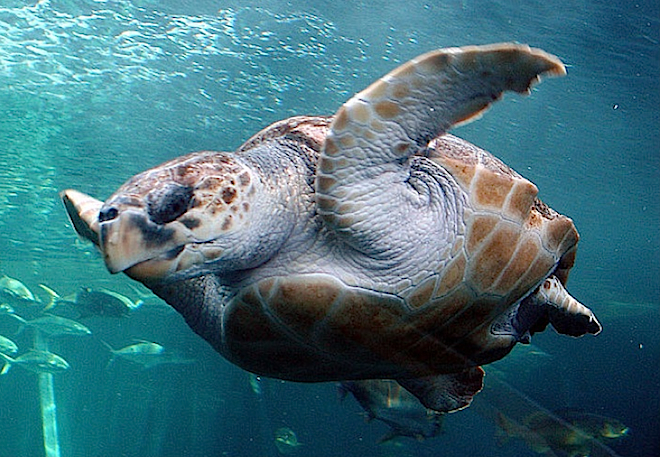 2) Loggerhead turtle./Damien du Toit, Flickr. If you trawl a fine mesh net through any of the globe's five subtropical gyres – giant ocean vortexes where currents converge and swirl unhurriedly – you will haul on deck a muddle of brown planktonic goop, the occasional fish, squid or Portuguese man-of-war – and, almost certainly, a generous sprinkling of colourful plastic particles, each no larger than your fingernail. Every flake of plastic cup or shard of toothbrush handle is a sponge for persistent organic pollutants (POPs) – potentially hazardous compounds that do not degrade easily and cling to any hard surface they find. The fate of all this plastic determines not only the health of marine life, but also our own; if fish are feasting on these toxic morsels, then we probably are too. Last month researchers from the 5 Gyres Institute in Santa Monica, California, and the Algalita Marine Research Foundation in Long Beach, California, sailed into Piriápolis, Uruguay. They had just completed the third leg of the first expedition ever to study plastic pollution in the South Atlantic subtropical gyre. In every single trawl, the team discovered plastic. "This issue has only recently come to the public's attention," says Anna Cummins, co-founder of 5 Gyres. "We're trying to document the issue and get baseline information because there is such a scarcity of data." There are still significant gaps in the data the crew can collect, however. The nets that they use cannot capture plastic particles that are smaller than one-third of a millimetre across. "After a certain size these particles just disappear," says Cummins. "What is their ultimate state? They could very well break down to a size where they are ingested by fish." Cummins also explains that trawling gathers plastic particles from surface waters only. Different kinds of plastic may be suspended at different depths – a dreadful rainbow of rubbish spanning the ocean from top to bottom – but no one has done the research to find out. What 5 Gyres researchers are currently investigating, however, is whether surface-feeding fish are ingesting plastic – and if so, what that does to them. Chelsea Rochman, who studies marine ecology and ecotoxicology at San Diego State University in California, joined the 5 Gyres team in November for a month-long trawl in the South Atlantic. In addition to sampling the water and plastic, Rochman used a special net to collect around 660 lanternfish – a ubiquitous family of small bioluminescent fish that make up around 65 per cent of all deep sea fish biomass. Lanternfish inhabit the dim depths during the day, but swim to the surface at night to feed, so if any fish would have plastic in their guts, it would be these guys. Back at her lab, Rochman has started analysing the water and plastic samples for the presence of POPs. She has also started slicing open the lanternfish so she can determine if they are eating plastic and whether POPs are accumulating in their tissues. Rochman wants to see whether fish caught in highly polluted areas of the gyres have more plastic in their guts and higher levels of POPs than those taken from less polluted waters. Confirming that distinction would suggest that fish are indeed consuming toxic morsels. In another lab experiment, Rochman fed one group of fish a diet infused with plastic, and another group a plastic-free diet. Preliminary results show that the fish which ate plastic endured significant weight loss and liver damage. "We are going to look for tumours, cell death and congestion in the organs that filter toxins," she says. Plastic in the ocean would not be so worrisome if only certain areas were polluted, but it appears to travel everywhere. Worse, it's hard to pin down exactly where, say, the remains of a candy wrapper blown out to sea in China will eventually drift. One tool is providing some answers, however. For at least two decades oceanographers have deployed thousands of Lagrangian drifting buoys, which are designed to map surface ocean currents rather than wind patterns or waves. "We realised that our buoys are in fact a kind of marine debris," says Nikolai Maximenko of the University of Hawaii in Honolulu, who collaborated with 5 Gyres researchers to identify which areas of the ocean should have especially high levels of plastic pollution. Wherever the buoys gather most densely, the reasoning goes, is also where plastic particles should cluster. And that is what the researchers have found so far: all our plastic waste meets and circulates in the gyrating wastes of the ocean. More surprising is that despite the lure of the gyres, the buoys – and, therefore, probably plastic in general – really get around. "It's amazing to see the global patterns," says Maximenko. "I just found out that one surface drifter went very close to the North Pole in summer 2009, and another made two loops around Antarctica." What researchers have established so far is that the plastic in the oceans is persistent and pervasive. Investigations into what all this pollution means for wildlife and people are just getting started, but the early signs are not reassuring. "The ocean is not infinite. It doesn't have room for our waste," says Cummins. HONOLULU, Hawaii, U.S., Mar 24, 2011 (IPS) - That plastic bottle or plastic take-away coffee lid that has 20 minutes of use can spend decades killing countless seabirds, marine animals and fish, experts reported here this week. On remote Pacific island atolls, diligent albatross parents unknowingly fill their chicks' bellies with bits of plastic that resemble food. The chicks die of malnutrition, and when their bodies decay all those plastic bottle tops, disposable lighters, and the ubiquitous bits of plastic detritus get back into the environment in a cruel perversion of 'recycling'. There is now so much plastic in the oceans it is likely that virtually every seabird has plastic in its belly if its feeding habits mean it mistakes plastic bits for food. The same is true for sea turtles, marine animals or fish, experts say. Northern fulmars, a common seabird numbering in the millions, have a collective 45 tonnes worth of plastic bits in their bellies, estimates Jan Andries van Franeker, a biologist with the Institute for Marine Resources and Ecosystem Studies at the University of Wageningen in Holland. At least 95 percent of fulmars in the North Sea where van Franeker has been working for three decades have one to several dozen bits of plastic in their stomachs. The same is true for related species like the tiny Wilson's storm petrels, which unknowingly transport an estimated 35 tonnes of plastic from their wintering grounds in the North Atlantic to breeding grounds in the Antarctic, he says. "If a seabird's feeding habits mean it could mistake plastic for food, then it will likely have plastic in its stomach," he said in an interview at the weeklong Fifth International Marine Debris Conference, which ends Friday in Honolulu, Hawaii. It has been 10 years since the last international marine debris conference and the hope is that industry, civil society, researchers and policy makers will find common ground on the strategies and best practices to assess, reduce, and prevent the impacts of marine debris. "I sometimes have this kind of dream or nightmare where those fulmars drop all of that plastic on an audience in big conference room like this," van Franeker told IPS. "It would make a very clear statement." It is a statement that needs to be made with the escalating problem of the world's oceans being filled a staggering amount of plastic, fishing gear, and all other kinds of debris. There is no accurate accounting of exactly how much but it appears to be in the tens of millions of tonnes each year and is mostly from land-based sources. A 2006 United Nations Environment Programme estimate suggested every square kilometere of world's ocean has an average of 13,000 pieces of plastic litter floating on the surface. A walk on an ocean shoreline anywhere in the world will provide ample evidence of the scale of the problem - unless it was recently cleaned up. The Ocean Conservancy, a U.S.-based NGO, has been leading beach and shoreline cleanups around the world for 25 years. Over that time, nearly nine million volunteers in 152 countries have cleaned up and catalogued 66 million kilogrammes of trash, according a new report released here in Honolulu. The top three trash items collected by number of items found were cigarette butts, food packaging and bottle caps or lids. Plastic bags, bottles and straws or stirrers also made the top 10. 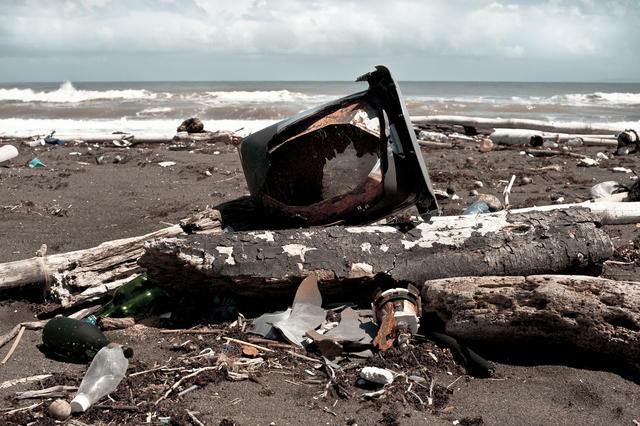 "People don't realise that the cumulative impact of marine debris is a major issue for the oceans," said Achim Steiner, executive director of the United Nations Environment Programme (UNEP). It has been five months since a state statute to reduce the single use of plastic bags has been enacted for three of North Carolina’s coastal counties—Currituck, Dare and Hyde—a region identified by its brand: the Outer Banks. Dare County manager, Bobby Outten said by telephone Wednesday, March 9 that compliance has not been an issue. "It’s not our responsibility to enforce a state law, but when you go into any of the stores, there are no plastic bags … they’re gone," Outten said. The statute does not apply to the purchase of fish and seafood, meat, poultry and produce while paper bags stamped with the recycled symbol are now the standard in big box stores like Wal-Mart, Food Lion and Harris Teeter, Outten said. "It’s just not an issue," he added. Incremental enactment of the statute has been in the works since September 2009 when Senate Bill 1018, ratified in June 2009, was amended. "There was a grace period, if you’d already ordered your bags you could use them but you couldn’t order any new ones," Outten said. "Basically it allowed people to get rid of what they had before the season started the next year." Smaller stores, less than 5,000 square feet, that are not part of a retail chain, have until May 1 this year before making the switch. The subject of a plastic bag ban was first mentioned locally by alderman Lisa Weeks while she was working with Sean Ahlum in September 2009 to develop a door-to-door recycling survey for Wrightsville Beach residents. Ahlum was then the president of the Surfrider Foundation Cape Fear chapter but has since joined the organization’s international board of directors. Weeks, now Mayor Pro Tem of the Wrightsville Beach Board of Aldermen said Ahlum is on the BOA’s April agenda to speak about Surfrider’s bag ban initiatives in larger locales, Washington, D.C., for example. "I think the Atlantic and Pacific garbage patch will resonate with people … with trash washing ashore," Weeks said. "It never goes away. It just breaks down, breaks down, breaks down and enters the food chain." Weeks, along with Mayor David Cignotti, has mentioned the possibility of a plastic bag law for New Hanover County to Rep. Danny McComas in January; but when the topic was raised by county commission vice chairman Jason Thompson at a joint meeting of aldermen and commissioners last month, in Weeks’ absence, Alderman Susan Collins said the item had not been discussed as a board. "It hasn’t been an item," Weeks said by telephone on Wednesday, March 9, "because I felt like it’s got to be a county-wide initiative so it’s really up to the county to see if it’s even feasible for us to write legislation before I put it on the agenda for us to make a resolution for it." There is more than one way to approach the larger issue besides an outright ban, Weeks said. "Some municipals do a 10-cent charge on the bag and when you bring it back you get credited so there’s an incentive to recycle the bags, and others charge an outright 10 cents a bag and use that money … for purchasing green open space," Weeks said. Outten, who said he keeps a stash of reusable cloth bags in his vehicle, shops at Food Lion, where he said, "They give you a nickel off your bill per bag." When the legislation process began, Outten said then Sen. Marc Basnight called elected officials and county administrators to talk with them about what he wanted to do, why he wanted to see it done and why it was important. Those ideals were later drafted in early 2009 by Sen. Josh Stein of Wake County as SB 1018. The ratified statute includes language that supports the detrimental effect that single-use discarded plastic bags have in the landfill and on the environment especially in a coastal setting—namely barrier islands that because of their proximity to the Gulf Stream are important sea turtle nesting grounds. "Discarded plastic bags contribute to overburdened landfills, threaten wildlife and marine life, degrade the beaches and other natural landscapes of North Carolina’s coast, and in many cases, require consumption of oil and natural gas during the manufacturing process." The statute also acknowledges the sheer numbers of seasonal visitors to barrier islands and the increased use of plastic bags due to the volume of restaurant, grocery and retail purchases. "Barrier islands are small and narrow, and therefore the comparative impact of plastic bags on the barrier islands is high," the statute states. Weeks said she spoke with Thompson about the feasibility of enrolling Masonboro Island into any draft resolution or future legislation as a stand-in for the National Seashore areas identified in the Outer Banks statute. Thompson has said he would not pursue the matter further until Wrightsville Beach aldermen had arrived at some consensus which Weeks is hoping to build as Ahlum makes the rounds in the next several months presenting Surfrider’s findings to Carolina Beach, Kure Beach and the county before she puts a resolution before the BOA.